A cup of Premium Arabica. (Extra Bold European Blend!) I don't know what any of that means, but that's what it says on the k-cup label. It's coffee and it's delicious. I made some yummy dinners this past week, including this tasty quinoa with mushrooms and green onions. I'm looking forward to the culinary Olympics this week. I'm talking 'bout Thanksgiving! I'll be making the usual dishes, including a spicy corn casserole that has made grown men cry. Oh look at this...another week with nary a post. Could someone inspire me? Anyone? If you can't inspire me then can you arrange for me to have an extra hour every day? That would work quite nicely, thanks. As always, I had PLANS. For instance, I planned on writing up more posts for Nonfiction November. Sigh. I finished Yes Please. (Hilarious and heart warming and everything you'd expect from Ms. Poehler) I'm currently in the middle of Stiff by Mary Roach. What a gem! So informative and so funny. I knew it was going to be good. I didn't know it was going to be this good. When I get a minute I'm going to head to Sophisticated Dorkiness to talk about the Nonfiction November readalong of The Restless Sleep. Estella's Revenge, Girlxoxo, and Traveling with T are hosting A Month of Favorites in December. Doesn't that sound like fun? Squeeing and Muppet Arm Flailing: over our new kitten! If you follow me on Instagram you've seen a few pictures and you know that she's cuter than can be and that she doesn't have a name. Still. We'll get there but it's hard to for so many people to agree on something. If only I could choose it myself. I'd have named her Nancy Mew (GET IT?!?) and have been done with it. Sadly, I've raised kids that have pesky opinions. That is one ridiculously cute kitten! Thanks :D I just want to eat her up! You made it here today. And that's something. If you find a way to increase our available time on earth, please take out a patent. You will be rich. If you figure out how to get an extra hour a day so that blog posts happen, clue me in! That kitten is such a cutie. 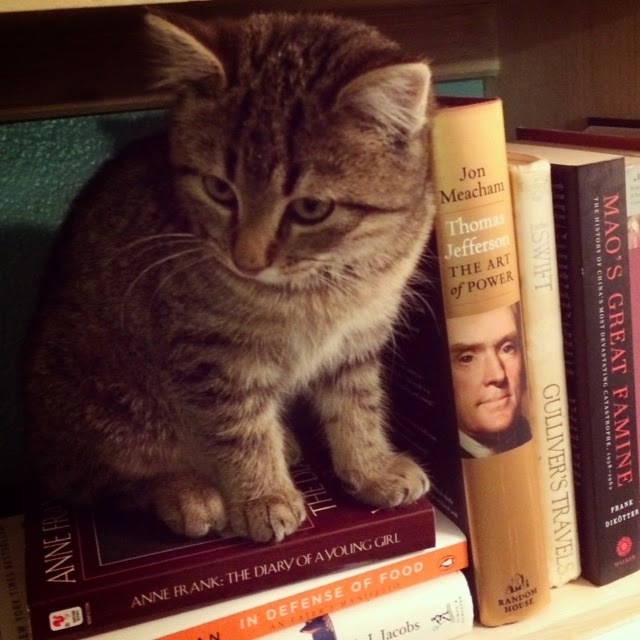 How appropriate that you posted a photo of cat with books. OH KITTY!!!!!!!! My sister once had a cat named Kitty. I would LOVE to have another cat but don't want to deal with the cat stuff (dander and litter box, mostly). Tis the season to be busy and it sounds like your blog has been quiet for good reasons. Don't feel bad or guilty about that! Though if I did have some extra time, I would certainly share. My time is all stolen in small little moments here and there. Enjoy Stiff! It was such a fun one to listen to and I've been meaning to read more of her books. Oh what a darling kitten. I have been blogging everyday for NaBloPoMo and its been tough and other things have slid. But its been fun (mostly) trying to find ways to post everyday. Menu plans i do anyway and my linkups are back which helps. I can't wait to see the photos. My youngest is 5 and we still haven't had professional family photos done that include him! Aww! That is an adorable addition to your family. 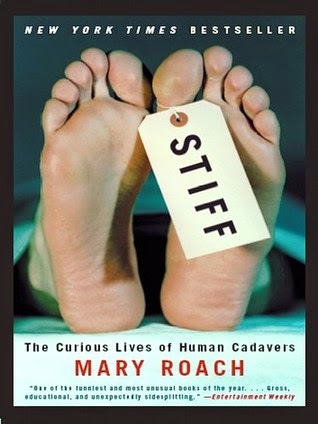 I want to read Stiff, I am so glad to see you giving it a thumbs up. And that quinoa recipe sounds great! I have a bookish friend who named her kitty Catsby (for Gatsby). And I'm hoping to read Stiff in the New Year...it's sitting in my room and I keep wanting to pick it up (darn TBR challenge...four more to go). Your kitty is sooooo cute!! Ha - I love your term for Thanksgiving! I'm going to start calling it the Culinary Olympics! I loved Nonfiction November (first time I participated) and am also going to join in on A Month of Favs..probably not everyday, but hopefully a couple days a week. Oh. She is adorable!! I am having baby animal lust for some reason, so I love seeing all these puppy and kitty pictures! I would totally go with Nancy Mew. Have a great week and an amazing Thanksgiving! !